This week I am discussing the core of my professional business: relationships. We have three wonderful volunteers who have offered to share their charts, which I am eternally grateful for. So you can learn about their charts and the problems/issues that they're working through. This week I am answering Lisa's question about the difference between a house and a sign. A sign is the way a planet operates. The house is where all the action takes place and where the focus is. 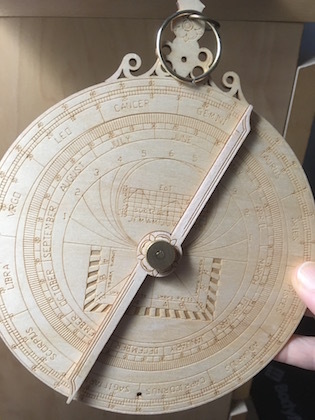 Here's my Astrolabe reverse side..you can just see the dates and the signs of the Zodiac. What happens if you have your Moon as a Singleton Planet?